What makes an ethical person? Students in Ethical Thinking in Society, Policy, and Law have been tackling that very complex question all year through a study of basic ethical constructs (utilitarianism, deontology, etc.) and ethical quandaries at the heart of scientific/medical issues, domestic/international policy issues, and constitutional law. For their final class project, students were asked to come up with a creative interpretation of their personal beliefs about the qualities of ethical people. 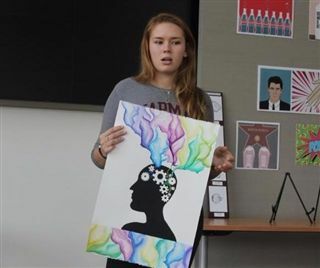 Students wrote skits and short stories with characters facing moral dilemmas, created artwork representing how individuals acquire and shift through ethical frameworks, gave speeches on the biology of altruism, and more.